This article is about a town in the United Kingdom. For other uses, see Poole (disambiguation). "Poole, England" redirects here. For the British Army general, see Poole England. Poole (/puːl/ ( listen)) is a large coastal town and seaport in Dorset, on the south coast of England. The town is 33 kilometres (21 mi) east of Dorchester, and adjoins Bournemouth to the east. Since 1 April 2019 the local authority is Bournemouth, Christchurch and Poole Council which is a unitary authority. Poole had an estimated population of 151,500 (mid 2016 census estimates) making it the second largest town in ceremonial county of Dorset. Together with Bournemouth and Christchurch, Poole has a total population of over 465,000. "Ad Morem Villae De Poole" "According to the custom of the Town of Poole"
Human settlement in the area dates back to before the Iron Age. The earliest recorded use of the town's name was in the 12th century when the town began to emerge as an important port, prospering with the introduction of the wool trade. Later, the town had important trade links with North America and, at its peak during the 18th century, it was one of the busiest ports in Britain. In the Second World War, Poole was one of the main departing points for the Normandy landings. Poole is a tourist resort, attracting visitors with its large natural harbour, history, the Lighthouse arts centre and Blue Flag beaches. The town has a commercial port with cross-Channel freight and passenger ferry services. The headquarters of the Royal National Lifeboat Institution (RNLI) are in Poole, and the Royal Marines have a base in the town's harbour. Despite their names, Poole is the home of The Arts University Bournemouth, the Bournemouth Symphony Orchestra and a significant part of Bournemouth University. 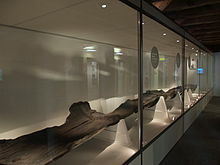 The Poole Logboat, a 2,000-year-old dugout canoe discovered during dredging works in Poole Harbour. The town's name derives from a corruption of the Celtic word bol and the Old English word pool meaning a place near a pool or creek. Variants include Pool, Pole, Poles, Poll, Polle, Polman, and Poolman. The area around modern Poole has been inhabited for the past 2,500 years. During the 3rd century BC, Celts known as the Durotriges moved from hilltop settlements at Maiden Castle and Badbury Rings to heathland around the River Frome and Poole Harbour. The Romans landed at Poole during their conquest of Britain in the 1st century and took over an Iron Age settlement at Hamworthy, an area just west of the modern town centre. In Anglo-Saxon times, Poole was included in the Kingdom of Wessex. The settlement was used as a base for fishing and the harbour a place for ships to anchor on their way to the River Frome and the important Anglo-Saxon town of Wareham. Poole experienced two large-scale Viking invasions during this era: in 876, Guthrum sailed his fleet through the harbour to attack Wareham, and in 1015, Canute began his conquest of England in Poole Harbour, using it as a base to raid and pillage Wessex. Following the Norman conquest of England, Poole rapidly grew into a busy port as the importance of Wareham declined. The town was part of the manor of Canford, but does not exist as an identifiable entry in the Domesday Book. The earliest written mention of Poole occurred on a document from 1196 describing the newly built St James's Chapel in "La Pole". The Lord of the Manor, Sir William Longspée, sold a charter of liberties to the burgesses of Poole in 1248 to raise funds for his participation in the Seventh Crusade. Consequently, Poole gained a small measure of freedom from feudal rule and acquired the right to appoint a mayor and hold a court within town. Poole's growing importance was recognised in 1433 when it was awarded staple port status by King Henry VI, enabling the port to begin exporting wool and in turn granting a licence for the construction of a town wall. In 1568, Poole gained further autonomy when it was granted legal independence from Dorset and made a county corporate by the Great Charter of Elizabeth I. During the English Civil War, Poole's puritan stance and its merchants' opposition to the ship money tax introduced by King Charles I led to the town declaring for Parliament. Poole escaped any large-scale attack and with the Royalists on the brink of defeat in 1646, the Parliamentary garrison from Poole laid siege to and captured the nearby Royalist stronghold at Corfe Castle. Beech Hurst in the town centre, a Georgian mansion built in 1798 for a wealthy Newfoundland merchant. Poole established successful commerce with the North American colonies in the 16th century, including the important fisheries of Newfoundland. Trade with Newfoundland grew steadily to meet the demand for fish from the Catholic countries of Europe. Poole's share of this trade varied but the most prosperous period started in the early 18th century and lasted until the early 19th century. The trade followed a three-cornered route; ships sailed to Newfoundland with salt and provisions, then carried dried and salted fish to Europe before returning to Poole with wine, olive oil, and salt. By the early 18th century Poole had more ships trading with North America than any other English port and vast wealth was brought to Poole's merchants. This prosperity supported much of the development which now characterises the Old Town where many of the medieval buildings were replaced with Georgian mansions and terraced housing. The end of the Napoleonic Wars and the conclusion of the War of 1812 ended Britain's monopoly over the Newfoundland fisheries and other nations took over services provided by Poole's merchants at a lower cost. Poole's Newfoundland trade rapidly declined and within a decade most merchants had ceased trading. The town grew rapidly during the industrial revolution as urbanisation took place and the town became an area of mercantile prosperity and overcrowded poverty. At the turn of the 19th century, nine out of ten workers were engaged in harbour activities, but as the century progressed ships became too large for the shallow harbour and the port lost business to the deep water ports at Liverpool, Southampton and Plymouth. Poole's first railway station opened in Hamworthy in 1847 and later extended to the centre of Poole in 1872, effectively ending the port's busy coastal shipping trade. The beaches and landscape of southern Dorset and south-west Hampshire began to attract tourists during the 19th century and the villages to the east of Poole began to grow and merge until the seaside resort of Bournemouth emerged. Although Poole did not become a resort like many of its neighbours, it continued to prosper as the rapid expansion of Bournemouth created a large demand for goods manufactured in Poole. During World War II, Poole was the third largest embarkation point for D-Day landings of Operation Overlord and afterwards served as a base for supplies to the allied forces in Europe. Eighty-one landing craft containing American troops from the 29th Infantry Division and the US Army Rangers departed Poole Harbour for Omaha Beach. Poole was also an important centre for the development of Combined Operations and the base for a US Coast Guard rescue flotilla of 60 cutters. Much of the town suffered from German bombing during the war and years of neglect in the post-war economic decline. Major redevelopment projects began in the 1950s and 1960s and large areas of slum properties were demolished and replaced with modern public housing and facilities. Many of Poole's historic buildings were demolished during this period, particularly in the Old Town area of Poole. Consequently, a 6-hectare (15-acre) Conservation Area was created in the town centre in 1975 to preserve Poole's most notable buildings. On 1 April 1997, the town was made a unitary authority following a review by the Local Government Commission for England, and became once again administratively independent from Dorset. The borough reverted to its previous title of the Borough and County of the Town of Poole, which recalled its status as a county corporate before the implementation of the Local Government Act 1888. For local elections, 42 councillors are elected across 16 wards and elections take place every four years. As of December 2016, the council is made up of 30 Conservative, 7 Liberal Democrat, 3 Poole People, 1 UK Independence Party and 1 Independent councillors. Poole's council leader is Janet Walton (Conservative) and the Mayor is Sean Gabriel (Conservative). Poole's Sheriff, a position created by the town's charter of 1568 and just one of 16 Sheriffs in England and Wales, is Elaine Atkinson OBE (Conservative). Poole is represented by three parliamentary constituencies in the House of Commons; Poole, Mid Dorset and North Poole, and Bournemouth West. The borough constituency of Poole has existed since 1950. Previously the town had been a parliamentary borough, electing two members of parliament from 1455 until 1865 when representation was reduced to one member. In 1885 the constituency was abolished altogether and absorbed into the East Dorset constituency until its reintroduction in 1950. Robert Syms (Conservative) has been the Member of Parliament since 1997. At the 2015 general election, the Conservatives won a majority of 15,789 and 50.1% of the vote. The UK Independence Party won 16.8% of the vote, Labour 12.9% and the Liberal Democrats 11.8%. The county constituency of Mid Dorset and North Poole was created in 1997 and includes the north east of Poole, Wimborne Minster, Wareham and extends into rural Dorset. At the 2015 general election, the Conservative candidate Michael Tomlinson gained the constituency from the Liberal Democrats with a majority of 10,530 and 50.8% of the vote. The Liberal Democrats won 28.2% of the vote, the UK Independence Party 12.2% and Labour 6%. The boundary of the Bournemouth West borough constituency was extended to include the Poole local council wards Branksome East and Alderney in 2010. It is represented by Conor Burns, a Conservative Member of Parliament, who retained the seat with a majority of 12,410 and 48.2% of the vote in 2015. Poole is included in the South West England constituency for elections to the European Parliament. The design of the coat of arms originated in a seal from the late 14th century and were recorded by Clarenceux King of Arms during the heraldic visitation of Dorset in 1563. The wavy bars of black and gold represent the sea and the dolphin is sign of Poole's maritime interests. The scallop shells are the emblem of Saint James and are associated with his shrine at Santiago de Compostela – a popular destination for Christian pilgrims departing from Poole Harbour in the Middle Ages. The arms were confirmed by the College of Arms on 19 June 1948, and at the same time the crest (a mermaid supporting an anchor and holding a cannonball) was granted. 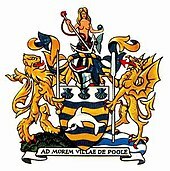 Following local government reorganisation in 1974, the 1948 arms were transferred to Poole Borough Council. In 1976, the council received the grant of supporters for the coat of arms. The supporters refer to important charters given to the town; to the left is a gold lion holding a long sword representing William Longespee who in 1248 granted the town's first charter; on the right is a dragon derived from the Royal Arms of Elizabeth I who granted Poole county corporate status in 1568. The Latin motto – Ad Morem Villae De Poole, means: According to the Custom of the Town of Poole, and derives from the Great Charter of 1568. Poole is a complex shore of the English Channel; it lies on the northern and eastern edges of Poole Harbour, 179 kilometres (111 mi) west-southwest of London. The oldest part of the town (including the historic Old Town, Poole Quay and the Dolphin Shopping Centre) lies to the south-east of Holes Bay on a peninsula jutting into the harbour, although much of the land to the east of the peninsula has been reclaimed from the harbour since the mid 20th century. To the west is Upton and Corfe Mullen and across the northern border at the River Stour lies Wimborne Minster. At the eastern edge of Poole, the town abuts Bournemouth and the settlements of Kinson, Winton and Westbourne. To the south of Poole along the coast lies Poole Bay, featuring 4.8 kilometres (3.0 mi) of sandy beaches from Sandbanks in the west to Bournemouth in the east. Poole is made up of numerous suburbs and neighbourhoods, many of which developed from villages or hamlets that were absorbed into Poole as the town grew. The natural environment of Poole is characterised by lowland heathland to the north and wooded chines and coastline to the south. The heathland habitat supports the six native British reptile species and provides a home for a range of dragonflies and rare birds. Development has destroyed much of the heath but scattered fragments remain to the north of Poole and have been designated Special Protection Areas. The town lies on unresistant beds of Eocene clays (mainly London Clay and Gault Clay), sands and gravels. The River Frome runs through this weak rock, and its many tributaries have carved out a wide estuary. At the mouth of the estuary sand spits have been deposited, enclosing the estuary to create Poole Harbour. The harbour is the largest natural harbour in Europe and the claimant of the title of second largest natural harbour in the world after Sydney Harbour. It is an area of international importance for nature conservation and is noted for its ecology, supporting salt marshes, mudflats and an internationally important habitat for several species of migrating bird. It has been designated a Site of Special Scientific Interest (SSSI), a Special Protection Area and a Ramsar site as well as falling within an Area of Outstanding Natural Beauty. The harbour covers an area of 38 square kilometres (15 sq mi) and is extremely shallow: although the main shipping channels are 7.5 metres (25 ft) deep the average depth of the harbour is 48 centimetres (1.57 ft). It contains several small islands, the largest is Brownsea Island, a nature reserve owned by the National Trust and the birthplace of the Scouting movement and location of the first Scout Camp. Britain's largest onshore oil field operates from Wytch Farm on the south shore of the harbour. 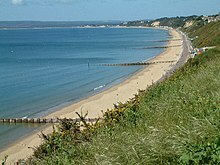 The oil reservoirs extend under the harbour and eastwards from Sandbanks and Studland for 10 kilometres (6.2 mi) under the sea to the south of Bournemouth. Situated directly to the east of the Jurassic Coast, Poole is a gateway town to the UNESCO World Heritage Site, which includes 153 kilometres (95 mi) of the Dorset and east Devon coast important for its geology, landforms and rich fossil record. The South West Coast Path stretches for 1,014 kilometres (630 mi) from Minehead in Somerset, along the coast of Devon and Cornwall and on to Poole. The path is the England's longest national trail at 1,014 kilometres (630 mi). Due to its location on the south coast of England, Poole has a temperate climate with a small variation in daily and annual temperatures. The average annual mean temperature from 1971 to 2000 was 10.2 to 12 °C (50.4 to 53.6 °F). The warmest months in Poole are July and August, which have an average temperature range of 12 to 22 °C (54 to 72 °F), and the coolest months are January and February, which have a range of 2 to 8.3 °C (35.6 to 46.9 °F). Mean sea surface temperatures range from 6.9 °C (44.4 °F) in February to 18.5 °C (65.3 °F) in August. The average annual rainfall of 592.6 millimetres (23.33 in) is well below the UK average of 1,126 millimetres (44.3 in). Poole lies at the centre of a green belt region that extends into the wider surrounding counties. It is in place to reduce urban sprawl, prevent the towns in the South East Dorset conurbation from further convergence, protect the identity of outlying communities, and preserve nearby countryside. This is achieved by restricting inappropriate development within the designated areas, and imposing stricter conditions on permitted building. Poole has areas of green belt to the north and west of the district, mostly on the fringes of the shared border with the Purbeck and East Dorset districts. These cover landscape features and greenfield facilities including the rivers Stour and Sherford and their floodplains, the Stour Valley Way, Canford Heathland, Dunyeats Hill and Corfe and Barrow Hill nature reserves, Upton Country Park, Pergins Island, and the Wimborne District Society of Model Engineers miniature railway. The small communities at Merley, Canford Magna, Oakley and Oakley Hill are separated from the main urban area, and while inset, are not covered by green belt. However, the isolated hamlets of Knighton, Merley Hall and Ashington are 'washed over', and development is limited in these locations. A specific function of the restrictions is to prevent further urban encroachment towards Wimborne Minster, in order to help maintain its historic character and surroundings. Poole merges with several other towns to form the South East Dorset conurbation which has a combined population of over 465,000, forming one of the South Coast's major urban areas. In the 2011 census the population of the borough of Poole was 147,645, an increase from 138,288 in 2001. The town has a built-up area of 65 square kilometres (25 sq mi), giving an approximate population density of 2,128 residents per square kilometre (5,532 per sq mi) in 60,512 dwellings. The population has grown steadily since the 1960s, inward migration has accounted for most of the town's growth and a significant part of this has been for retirement. Housing stock has increased by over 100% in the past 40 years from 30,000 in 1961 to approximately 62,700 in 2004. Compared to the rest of England and Wales, Poole has an above average number of residents aged 65+ (20.3%), but this is less than the Dorset average of 22.2%. The largest proportion of the population (24.8%) is between the ages of 45 to 64, slightly above the national average of 23.8%. Population projections have predicted a continual growth; a population of 151,481 is estimated by 2016. The district is overwhelmingly populated by people of a white ethnic background, 95.98% of residents are of White British ethnicity, well above the rest of England at 86.99%. Minority ethnic groups (including those in white ethnic groups who did not classify themselves as British) represent 4.0% of Poole's population. The largest religion in Poole is Christianity, at almost 74.34%, slightly above the United Kingdom average of 71.6%. The next-largest sector is those with no religion, at almost 16.23%, also above the UK average of 15.5%. The average house price in Poole is high compared to the rest of the UK and the surrounding south west region. The average price of a property in Poole in 2008 was £274,011; detached houses were on average £374,150, semi-detached and terraced houses were cheaper at £226,465 and £217,128 respectively. An apartment or flat costs on average £216,097, more than any other part of Dorset. The average house prices in Poole are boosted by those in Sandbanks which had the fourth most expensive house prices in the world in 2000; in 2007 the average house price was £488,761. A study in 2006 by the National Housing Federation reported that Poole was the most unaffordable town in which to live in the UK. Poole's economy is more balanced than the rest of Dorset. In the 1960s, prosperity was fuelled by growth in the manufacturing sector, whereas the 1980s and 1990s saw expansion in the service sector as office-based employers relocated to the area. The importance of manufacturing has declined since the 1960s but still employed approximately 17% of the workforce in 2002 and remains more prominent than in the economy of Great Britain as a whole. Sunseeker, the world's largest privately-owned builder of motor yachts and the UK's largest manufacturer, is based in Poole and employs over 1,800 people in its Poole shipyards. Other major employers in the local manufacturing industry include Mathmos, Lush, Siemens and Ryvita. Poole has the largest number of industrial estates in South East Dorset, including the Nuffield Industrial estate, Mannings Heath, Arena Business Park, Poole Trade Park and the Branksome Business Centre. The service sector is the principal economy of Poole; a large number of employees work for the service economy of local residents or for the tourist economy. During the 1970s, Poole's less restrictive regional planning policies attracted businesses wishing to relocate from London. These included employers in the banking and financial sector, such as Barclays Bank (who operate a regional headquarters in Poole), American Express Bank and the corporate trust division of Bank of New York Mellon. Other important service sector employers include the national headquarters and college of the Royal National Lifeboat Institution (RNLI), the UK headquarters of Fitness First, Bournemouth University and Arts University Bournemouth. 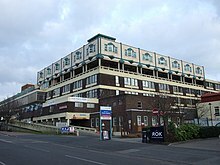 Poole is also the headquarters for clothing company Animal, cosmetics manufacturer, Lush, and Merlin Entertainments, the world's second-largest theme park operator after Disney. The Dolphin Shopping Centre is Poole's main retail area, and the largest indoor shopping centre in Dorset. It opened in 1969 as an Arndale Centre, and underwent three major refurbishments in 1980, 1989 and 2004. The centre provides 47,000 square metres (510,000 sq ft) of retail space with 110 stores and two multi-storey car parks with 1,400 parking spaces. A pedestrianised high street containing shops, bars, public houses and restaurants connects the Dolphin Centre with the historic Old Town area and Poole Quay. Tourism is important to the Poole's economy and was worth an estimated £158 million in 2002. Poole's Harbour, Quay and the beaches are some of the main attractions for visitors. Visitor accommodation consists of hotels, guest houses and bed and breakfast rooms located around the town, particularly in Sandbanks and the town centre. Rockley Park, a large caravan site in Hamworthy, is owned and operated by Haven Holidays. Since the 1970s, Poole has become one of Britain's busiest ports. Investment in new port facilities in Hamworthy, and the deepening of shipping channels allowed considerable growth in cross-channel freight and passenger traffic. The port is a destination for bulk cargo imports such as steel, timber, bricks, fertiliser, grain, aggregates and palletised traffic. Export cargoes include clay, sand, fragmented steel and grain. Commercial ferry operators run regular passenger and freight services from Poole to Cherbourg, St Malo and the Channel Islands. The Royal Marines operate out of the harbour at RM Poole, established in Hamworthy in 1954. The base is home to special forces unit the Special Boat Service and a detachment of the Royal Marines Reserve. In 2008, 105 fishing boats were registered and licensed to the port and held a permit issued by the Southern Sea Fisheries District Committee (SSFDC) to fish commercially. It is the largest port in terms of licences in the SSFDC district which covers the coastline of Dorset, Hampshire and the Isle of Wight, and one of the largest registered fishing fleets in the UK. However, the fleet is gradually declining because of rising fuel costs and restrictive fishing quotas introduced by the European Union. A large number of unlicensed boats also operate charted or private angling excursions. Poole Quay, once a busy centre of maritime trade, has become increasingly popular with tourists. Poole Quay is a visitor attraction to the south of the town centre lined with a mixture of traditional public houses, new bars, redeveloped warehouses, modern apartment blocks and historic listed buildings. Once the busy centre of Poole's maritime industry, all port activities moved to Hamworthy in the 1970s as the Quay became increasingly popular with tourists. The Grade II* listed Customs House on the quay-front was built in 1814 and now functions as a restaurant and bar. Nearby the Grade I listed Town Cellars, a medieval warehouse built in the 15th century on the foundations of a 14th-century stone building, houses a local history centre. Scaplen's Court, another Grade I listed building, also dates from the medieval era. Poole Pottery has been redeveloped into an apartment block. Boats regularly depart from the quay during the summer and provide cruises around the harbour and to Brownsea Island, the River Frome and Swanage. Public artworks along the Quay include Sea Music – a large metal sculpture designed by Sir Anthony Caro, and a life-size bronze sculpture of Robert Baden-Powell created to celebrate the founding of the Scout Movement on Brownsea Island. At the western end of the quay near the mouth of Holes Bay is Poole Bridge. Built in 1927, it is the third bridge to be located on the site since 1834. Poole's Guildhall has played a varied part in the history of the town. A Grade II* listed building, the Guildhall was built in 1761 at a cost of £2,250. The new building included an open market house on the ground floor and a courtroom and offices for the town council on the first floor and has also been used as a Court of Record, Magistrates' Court, Court of Admiralty and a venue for Quarter Sessions. Between 1819 and 1821 the building was consecrated as a Parish Church while the old St. James Church was pulled down and replaced with the present church. During the Second World War the building was used as a canteen and meeting room for American soldiers prior to the invasion of France. The showers and washing facilities installed at this time were later converted into public baths which were used until the 1960s. The building was converted for use as the town museum between 1971 and 1991 but stood empty for the next 16 years. After a renovation project funded by Poole Borough Council, the restored Guildhall opened in June 2007 as a Register Office for weddings, civil partnerships and other civic ceremonies. Poole has several urban parks – the largest is Poole Park adjacent to Poole Harbour and the town centre. It opened in 1890 and is one of two Victorian parks in Poole. Designated a Conservation Area in 1995 and awarded a Green Flag in 2008, the park comprises 44.3 hectares (109 acres) of which 24 hectares (59 acres) include the park's man-made lake and ponds. The park contains two children's play areas, a miniature railway, tennis courts, a bowling green, a miniature golf course, an Italian restaurant and an indoor ice rink for children. A cricket field and pavilion at the eastern end are home to Poole Town Cricket Club and water sport activities such as sailing, windsurfing, kayaking and rowing take place on the large lake. A war memorial stands in the centre of the park as a monument to Poole citizens killed during the First and Second World Wars. The park hosts several road races such as the Race for Life and the annual Poole Festival of Running. Poole's sandy beaches are a popular tourist destination extending 4.8 kilometres (3.0 mi) along Poole Bay from the Sandbanks peninsular to Branksome Dene Chine at the border with Bournemouth. The beaches are divided into four areas: Sandbanks, Shore Road, Canford Cliffs Chine and Branksome Chine. Poole's beaches have been awarded the European Blue Flag for cleanliness and safety 21 times since 1987, more than any other British seaside resort and in 2000 the Tidy Britain Group resort survey rated Poole's beaches among the top five in the country. Along the seafront there are seaside cafés, restaurants, beach huts and numerous water-sports facilities. Royal National Lifeboat Institution Beach Rescue lifeguards patrol the coastline in the busy summer season between May and September. Poole falls within the Church of England Diocese of Salisbury and the Roman Catholic Diocese of Plymouth. Poole has many sites of Christian worship including five Grade II* and five Grade II listed churches, but no notable sites of worship for any other major religious groups. The Grade II* St James' Church is a simplified Gothic Revival style Church of England parish church in the Old Town which was rebuilt in 1820. The previous church on the site was first mentioned in documents from 1142 and had been extensively rebuilt in the 16th century, but in 1819 it was deemed structurally unsafe by a surveyors report. The United Reformed Church hall, also in the town centre, is a Grade II* building built in 1777. The other Grade II* churches are: St. Peter's Parish Church in Parkstone which was first built in 1833 and replaced in 1876; St Dunstan of Canterbury Orthodox Church, also in Parkstone, an Antiochian Orthodox church, formerly the Anglican Church of St Osmund, in a Neo-Byzantine style building; and the Parish Church of St. Aldhelm in Branksome, built by the architects Bodley and Garner in 1892 in the Gothic Revival style. Described by English Heritage as "one of Poole's most important landmarks", the Gothic Revival church of St Mary's in Longfleet, built in 1833, is one of Poole's Grade II listed churches. There are also two Christadelphian meeting halls in the town. Poole Harbour and Poole Bay are popular areas for a number of recreational pursuits, including sailing, windsurfing, surfing, kitesurfing and water skiing. The harbour's large areas of sheltered waters attract windsurfers, particularly around the northern and eastern shores. Water skiing takes place in the harbour in a special designated area known as the Wareham Channel. The waters around the harbour, Poole Bay and Studland Bay are also popular for recreational angling and diving. Poole's wide and sandy beaches are used for swimming, sunbathing, water sports and sailing. The beaches at Sandbanks are often used for sporting events such as the Sandbanks Beach Volleyball Festival, and the annual British Beach polo Championship. Since 1999 the town's Rossmore Leisure Centre has hosted the GMPD Poole Gymnastics Competition every October with the Holiday Inn Express hosting some of the competitors as well as previously a Disco on the Saturday evening which has since been scrapped, hundreds of competitors from across the country compete each year, the competition celebrated its 18th Anniversary in 2017. Poole Harbour is one of the largest centres for sailing in the UK with yacht clubs including East Dorset Sailing Club, Lilliput Sailing Club, Parkstone Yacht Club, Poole Yacht Club, Sandbanks Yacht Company and the Royal Motor Yacht Club. Parkstone Yacht Club hosted the OK Dinghy World Championships in 2004, the J/24 National Championships in 2006 and the J/24 European Championships in 2007, with the 2020 J24 Worlds.hosted here also and are the organisers of Youth Week and Poole Week – two of the largest annual dinghy regattas of their type in the country. Many Olympic and Paralympic sailors reside around the local area due to its close proximity to the Weymouth and Portland National Sailing Academy. Other sailors have gone on to be involved with World match racing, Volvo Ocean race and many more. 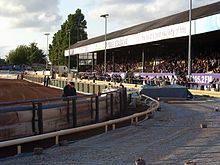 Poole Stadium is a greyhound racing venue and home to the Poole Pirates speedway team. Poole's oldest football team is Poole Town F.C., a semi-professional team who play in the Southern Football League – the seventh tier of the English football league system. Established in 1880, the team has had erratic success at their level; they have never risen above non-League levels but once reached the third round of the FA Cup. They played at Poole Stadium until 1994 and have since settled at Tatnam Farm, sharing the school playing field with Oakdale Junior School. Poole's other football teams are Hamworthy United, who formed in 1970 and also play in the Wessex Premier League, and amateur team Poole Borough F.C. who play in the Dorset Premier League. Poole is one of the largest towns in England without a professional football team. Poole's motorcycle speedway team, the Poole Pirates, were established and began racing at Poole Stadium in 1948 in the National League Division Three. The team now races in the top tier of league racing (the Elite League) which they won in 2008, 2011, 2013, and 2014. Poole Stadium is also a venue for greyhound racing; race nights occur three days a week throughout the year. Poole has three of the oldest Scout Association groups in the world. 1st Parkstone Air Scout Group holds records dating back to February 1908 and 1st Hamworthy Scout Group has records dating back to October 1908; both groups were formed out of the original Boys' Brigade units that had members take part in the original Scout Camp in 1907. Broadstone Group has records dating back to December 1908 and was home to the first King's/Queen's Scout. Holes Bay Nature Park, opened in 2015, includes Upton Country Park. The bay is an important feeding and roosting site for wetland birds. Corfe Barrows Nature Park, opened in 2016, is a group of eight natural sites, including Happy Bottom Nature Reserve, that is being jointly managed for wildlife and people in the north of the borough. Poole Tourism has developed and signed a number of trails and circular walks, collectively called the Poole Harbour Trails. Poole has a cycle network of over 50 miles and a number of scenic and long-distance routes including the Castleman Trailway, the Poole Heritage Cycle Route and the Bourne Valley Greenway. The 'Beating of the bounds' is an ancient annual custom first carried out in 1612, which revives the traditional checking of the sea boundaries awarded to Poole by the Cinque Port of Winchelsea in 1364. The Admiral of the Port of Poole (the mayor) and other dignitaries, and members of the public sail from the mouth of the River Frome to Old Harry Rocks to confirm the Mayor's authority over the water boundaries of the harbour and check for any encroachments. As there are no physical landmarks that can be beaten at sea, traditionally children from Poole were encouraged to remember the bounds of their town by taking part in the 'Pins and Points' ceremony involving the beating of a boy and pricking of a girl's hand with a needle. In modern times, the acts have been symbolically carried out. Poole's Summertime in the South is an annual programme providing various events on Poole Quay and Sandbanks from May until September. During June and July, live music, street entertainment and a large firework display take place on Poole Quay every Thursday evening. In August, the entertainment moves to the beaches at Sandbanks. Poole's Lighthouse is the largest arts centre complex in the United Kingdom outside London. Built in 1978, the centre contains a cinema, concert hall, studio, theatre, image lab and media suite and galleries featuring exhibitions of contemporary photography and modern digital art. The venue underwent an £8.5 million refurbishment in 2002, paid for by the Arts Council England, the Borough of Poole and private donations. The centre's concert hall has been the residence of the Bournemouth Symphony Orchestra's main concert series since their former base at the Bournemouth Winter Gardens closed in 1985. Situated in the centre of the Old Town, Poole Museum illustrates the story of the area and its people and the collections reflect the cultural, social and industrial history of Poole. Displays include the Poole Logboat and a detailed history of Poole from the Iron Age to the present day. The museum has a floor devoted to the history of Poole Pottery and some of the company's products are on display. Entrance to the museum is free. The A350 road is Poole town centre's main artery, running north along Holes Bay and on to the A35, and as a single carriageway to Bath and Bristol. To the east, the A337 road leads to Lymington and the New Forest. The A35 trunk road runs from Devon to Southampton and connects to the A31 on the outskirts of the town. The A31, the major trunk road in central southern England, connects to the M27 motorway at Southampton. From here the M3 motorway leads to London, and fast access may also be gained via the A34 to the M4 north of Newbury. Poole Bridge, a narrow bascule bridge constructed in 1927, connects the town centre and Hamworthy. Approval for a second bridge was given by the Department for Transport in 2006 and the £37 million Twin Sails bridge was completed in 2012. A road link to Studland and the Isle of Purbeck across the narrow entrance of Poole Harbour is provided by the Sandbanks Ferry. Most local bus services are run by morebus who are based at the town's bus station and have served Poole since 1983. morebus operate networks across Poole, Bournemouth, Christchurch and Salisbury, in addition to operations on the Isle of Purbeck and the New Forest. Other services are run by Bournemouth-based Yellow Buses and Damory Coaches. Poole is connected to towns and villages along the Jurassic Coast by the First Hampshire & Dorset X53 service, which runs along a route of 142 kilometres (88 mi) to Weymouth, Bridport, Lyme Regis, Seaton and Exeter. Poole is also a calling point for National Express Coaches, which have frequent departures to London Victoria Coach Station. There are also direct services to the Midlands, the North of England and to Heathrow and Gatwick airports. 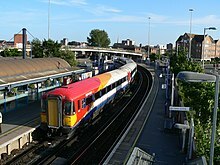 Poole has four railway stations on the South Western Main Line from London Waterloo to Weymouth. From east to west these are Branksome near the border with Bournemouth, Parkstone, Poole railway station in the town centre and Hamworthy. 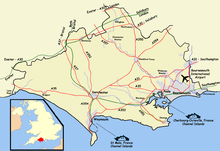 Services are operated by South Western Railway and consist of up to three trains an hour (fast, semi-fast and stopping services) to and from London, and twice an hour to and from Weymouth. Poole is a cross-Channel port for passengers and freight. Ferry services from Poole Harbour to Cherbourg are provided by Brittany Ferries who operate one round trip per day using the Barfleur  The Condor Ferries fast ferry Condor Liberation provides seasonal services to Guernsey, Jersey and St. Malo, Brittany. Bournemouth International Airport in Hurn, on the periphery of Bournemouth, is the nearest airport to Poole – 16 kilometres (9.9 mi) from Poole town centre. Ryanair, easyJet and Thomson Airways operate from the airport and provide scheduled services to destinations in the UK and Europe. Poole has eleven infant schools, seven junior schools, ten primary schools, nine secondary schools, three special schools, five independent schools and one college of further education. Two of Poole's secondary schools are grammar schools which maintain a selective education system, assessed by the eleven-plus exam. Poole High School is the largest secondary school in Poole with 1,660 pupils. The Bournemouth and Poole College attracts over 16,000 students a year and is one of the largest further education colleges in the country and the leading provider of academic and vocational education in Dorset. It has two centrally located main campuses in Poole and Bournemouth. From the 2007 General Certificate of Secondary Education (GCSE) results, Poole was ranked 18th out of 148 local authorities in England based on the percentage of pupils attaining at least five A* to C grades at GCSE level including maths and English (54.5% compared with the national average of 46.8%). Parkstone Grammar School was the most successful secondary school in Poole for GCSE results in 2007: 100% of pupils gained five or more GCSEs at A* to C grade including maths and English. Canford School also achieved 100% and Poole Grammar School was the next best performing school with 98%. Poole High School achieved 39% and the worst performing school was Rossmore Community College where only 19% of students achieved five or more A* to C grade results. Poole's grammar schools were also the best performing for A-level results. Poole Grammar School was the 60th most successful school/sixth form in the country in 2007: each student achieved on average 1071.4 points compared to the national average of 731.2. Parkstone Grammar School students averaged 1017.9 points. Bournemouth University was designated as a university in 1992 and despite its name, the university's main campus (the Talbot Campus) and buildings are within the boundaries of Poole Borough; a smaller campus is situated in Bournemouth itself. Media courses are the university's strength, and recent teaching quality assessments have resulted in ratings of 'excellent' for courses in the areas of communication and media, business and management, catering and hospitality, archaeology and nursing and midwifery. The Arts University Bournemouth was designated as a university in 2012 and is located at Wallisdown. It offers undergraduate, foundation degree, postgraduate and further education courses in contemporary arts, design and media. Home Office policing is provided by the Poole and Bournemouth Division of Dorset Police which has one police station in Poole on Wimborne Road in the town centre. Dorset Fire and Rescue Service provides statutory emergency fire and rescue services for Poole and are based at Poole Fire Station in Creekmoor which opened in 2008. The former fire station on Wimborne Road was demolished in 2008 and was replaced with a joint fire and police divisional headquarters which opened in 2009. Poole Hospital is a large NHS Foundation Trust hospital in Longfleet with 638 beds. 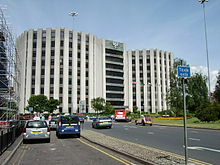 It opened in 1969 as Poole General Hospital, replacing Poole's Cornelia Hospital which had stood on the site since 1907. The hospital is the major trauma center for East Dorset and provides core services such as child health and maternity for a catchment area including Bournemouth and Christchurch. Specialist services such as neurological care and cancer treatment are also provided for the rest of Dorset. The South Western Ambulance Service provides emergency patient transport. Waste management and recycling are co-ordinated by Poole Borough Council in partnership with Viridor. Locally produced inert waste is sent to landfill for disposal. Recycle waste is taken to Viridor's Materials Recycling Facility in Crayford for processing. Poole's distribution network operator for electricity is Scottish and Southern Energy. Drinking and waste water is managed by Wessex Water; groundwater sources in Wiltshire and Dorset provide 75% of drinking water, the rest comes from reservoirs fed by rivers and streams. Poole has one main local newspaper, the Daily Echo, which is owned by Newsquest. Published since 1900, the newspaper features news from Poole, Bournemouth and the surrounding area. Issues appear Monday through Saturday with an average daily circulation of 13,579. For local television, Poole is served by the BBC South studios based in Southampton, and ITV Meridian from studios in Whiteley. Local radio stations broadcasting to the town include BBC Radio Solent, Wave 105, Heart Solent, Sam FM, Fire Radio and Hot Radio. The town has been the birthplace and home to notable people, of national and international acclaim. Former residents include British radio disc jockey Tony Blackburn, the artist Augustus John, John Lennon's aunt and parental guardian Mimi Smith, and The Lord of the Rings author J. R. R. Tolkien who lived in Poole for four years during his retirement. Alfred Russel Wallace, the 19th century explorer, naturalist and co-formulator of the theory of evolution by natural selection, moved to Poole in 1902 when he was 78 years old and is buried in Broadstone cemetery. Notable people born in Poole include Greg Lake of the band Emerson, Lake & Palmer, the author John le Carré, the novelist Maggie Gee, stage actor Oswald Yorke, actress Louisa Clein, cellist Natalie Clein, boxer Freddie Mills, the writer and actor David Croft, and James Stephen, the principal lawyer associated with the British abolitionist movement. Edgar Wright, the director of films such as Shaun of the Dead, Hot Fuzz and The World's End was born in Poole and out of the five previous British winners of the Miss World title, two have hailed from Poole: Ann Sydney and Sarah-Jane Hutt. Harry Redknapp, the former Tottenham Hotspur F.C. manager, and his son Jamie Redknapp, a former England national football team player, have owned homes in Sandbanks. Former Blue Peter presenter Katy Hill was also born in Poole. Molly Kingsbury who competed in the 2018 Commonwealth Games was born in Poole. Susannah Fielding female actor in This Time with Alan Partridge. ^ a b UK Census (2011). "Local Area Report – Poole Local Authority (1946157353)". Nomis. Office for National Statistics. Retrieved 9 February 2018. ^ Mills, A.D. (2003). A Dictionary of British Place-Names. Oxford: Oxford University Press. ISBN 0-19-852758-6. ^ a b "The Story of Poole (Page 1)". Welcome to Poole. 2008. Retrieved 20 July 2008. ^ "History of Wareham". Wareham Town Council. 2008. Archived from the original on 7 January 2011. Retrieved 17 July 2008. ^ a b c d "History of Poole". Borough of Poole. 2008. Archived from the original on 5 January 2010. Retrieved 30 May 2008. ^ "The Story of Poole (Page 3)". Welcome to Poole. 2008. Retrieved 20 July 2008. ^ a b "The Harbour's History". Poole Harbour Commissioners. 2008. Retrieved 30 June 2008. ^ "Poole Cockle Trail". Poole Tourism. 2008. Archived from the original on 15 July 2011. Retrieved 3 September 2008. ^ a b "The Story of Poole (Page 4)". Welcome to Poole. 2008. Retrieved 23 May 2008. ^ "Poole, Dorset, England". The Dorset Page. 200. Retrieved 18 July 2008. ^ Beamish, Derek (1980). Poole and World War II. Poole Historical Trust. pp. 184–193. ISBN 0-86251-004-X. ^ "Coast Guard Rescue Flotilla One at Normandy". United States Coast Guard. 2005. Retrieved 26 April 2008. ^ "The Story of Poole (Page 5)". Welcome to Poole. 2008. Retrieved 23 May 2008. ^ "The Built Environment". Borough of Poole. 2008. Retrieved 20 July 2008. ^ "Meet Your Councillor". Borough of Poole. 2017. Retrieved 4 April 2017. ^ "Result of the Broadstone By-Election". Borough of Poole. 2016. Retrieved 3 January 2017. ^ a b "Mayor, Sheriff And Deputy Mayor". Borough of Poole. 2017. Retrieved 4 April 2017. ^ "Cabinet". Borough of Poole. 2017. Retrieved 4 April 2017. ^ "Mayoral History - The Sheriff". Borough of Poole. 2017. Retrieved 4 April 2017. ^ "Robert Syms". The Guardian. London. 2008. Archived from the original on 30 November 2005. Retrieved 7 June 2008. ^ "Poole". BBC News. 2015. Retrieved 4 April 2017. ^ "Dorset Mid & Poole North". BBC News. 2015. Retrieved 4 April 2017. ^ "South West". BBC News. 2014. Retrieved 4 April 2017. ^ "Visitation of Dorsetshire". UK Genealogy Archives. 2007. Archived from the original on 9 July 2007. Retrieved 3 November 2007. ^ a b c "Coat of Arms". Borough of Poole. 2008. Retrieved 5 December 2012. ^ "Geology of the Central South Coast of England". University of Southampton. 2006. Retrieved 14 August 2007. ^ "Sandbanks Sand Spit". School of Ocean and Earth Science, University of Southampton. Retrieved 5 August 2008. ^ "Harbour". Borough of Poole. 2008. Archived from the original on 6 July 2008. Retrieved 30 June 2008. ^ a b c "Poole Harbour Aquatic Management Plan 2006" (PDF). EcoPorts. 2006. Archived from the original (PDF) on 17 March 2010. Retrieved 3 June 2008. ^ "The Dredging Operation". PooleBay.net. 2008. Retrieved 3 June 2008. ^ "Rivers Piddle and Frome, and Poole Harbour" (PDF). Centre for Environment, Fisheries and Aquaculture Science. 2008. Retrieved 30 June 2008. ^ Woolgar, Brian; La Riviere, Sheila (2002). Why Brownsea? The Beginnings of Scouting. Brownsea Island Scout and Guide Management Committee (re-issue 2007, Wimborne Minster: Minster Press). ^ "BP Asset Portfolio: Wytch Farm" (PDF). BP plc. Retrieved 27 June 2008. ^ Andrews I.J. & Balson P.S. 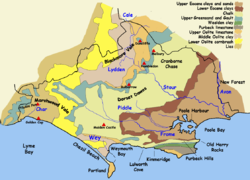 (1995), Wight: Sheet 50N 02W Solid Geology, 1:250,000 Geological map series, Keyworth: British Geological Survey. ^ a b "Poole". Jurassic Coast. 2006. Retrieved 3 June 2008. ^ "Other National Trails". South West Coast Path. 2006. Retrieved 5 December 2012. ^ "Mean Temperature Annual Average". Met Office. 2001. Archived from the original on 1 August 2013. Retrieved 30 May 2008. ^ a b "Weather Averages Poole, England". Msn.com. 2008. Retrieved 30 May 2008. ^ "Cefas Station 23: Bournemouth". The Centre for Environment Fisheries & Aquaculture Science. 2006. Archived from the original on 12 June 2008. Retrieved 30 May 2008. ^ "UK 1971–2000 averages". Met Office. 2008. Retrieved 12 October 2008. ^ a b c "Poole Local Plan Review - Draft Green Belt Review". poole.gov.uk. ^ a b "Key Figures for 2001 Census: Key Statistics". Office for National Statistics. 2001. Retrieved 2 June 2008. ^ a b c d e f g h i j k l m "A Profile of Poole". Borough of Poole. 2004. Archived from the original on 5 October 2013. Retrieved 2 June 2008. ^ "Census 2001". Office for National Statistics. 2001. Retrieved 30 May 2008. ^ "Household spaces and accommodation type". Office for National Statistics. 2001. Retrieved 2 June 2008. ^ a b "Housing". Borough of Poole. 2004. Retrieved 2 June 2008. ^ a b "Religion in Britain". Office for National Statistics. 2001. Archived from the original on 19 February 2008. Retrieved 22 February 2008. ^ a b "UK House Prices". British Broadcasting Corporation. 2007. Retrieved 2 June 2008. ^ a b "Britain's golden riviera". BBC News. 7 October 2000. Retrieved 2 June 2008. ^ "Price study looks at seaside life". BBC News. 11 August 2007. Retrieved 2 June 2008. ^ "Dorset town is least affordable". BBC News. 17 August 2006. Retrieved 2 June 2008. ^ "The name's Sunseeker". Bournemouth Daily Echo. 2006. Retrieved 3 June 2008. ^ "Town Profile – Poole". Invest in Dorset. 2004. Archived from the original on 20 August 2008. Retrieved 3 June 2008. ^ "Merlin Entertainments Group". Blooloop.com. 2008. Archived from the original on 22 November 2008. Retrieved 4 August 2008. ^ a b "Shopping". Poole Tourism. 2008. Archived from the original on 28 September 2008. Retrieved 26 July 2008. ^ "Rockley Park". Haven Holidays. 2008. Archived from the original on 17 May 2008. Retrieved 22 June 2018. ^ "The History of RM Poole". Ministry of Defense. 2008. Archived from the original on 4 June 2008. Retrieved 30 June 2008. ^ "RMR Poole". Ministry of Defense. 2008. Archived from the original on 1 December 2008. Retrieved 30 June 2008. ^ "The secretive sister of the SAS". BBC News. 16 November 2001. Retrieved 30 July 2008. ^ a b "Fishermen cast into a part-time role by quotas". Bournemouth Daily Echo. 2008. Retrieved 3 June 2008. ^ a b "Fishing Activity" (PDF). Royal Haskoning. 2006. Retrieved 3 June 2008. ^ "Fishermen protest as fuel costs strike hard". Bournemouth Daily Echo. 2008. Retrieved 4 August 2008. ^ "Listed Buildings Online: Customs House". English Heritage. 2008. Retrieved 26 July 2008. ^ "Listed Buildings Online: The Town Cellar". English Heritage. 2008. Retrieved 26 July 2008. ^ "Listed Buildings Online: Scaplens Court". English Heritage. 2008. Retrieved 26 July 2008. ^ "Fired up over pottery future". Bournemouth Daily Echo. 2007. Retrieved 26 July 2008. 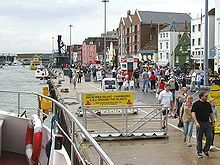 ^ "Poole Quay Cruises". PooleQuay.com. 2008. Archived from the original on 16 July 2008. Retrieved 26 July 2008. ^ "Baden-Powell Returns To Poole Quay". Borough of Poole. 2008. Retrieved 26 July 2008. ^ "Existing Lifting Bridge". Borough of Poole. 2008. Archived from the original on 2 November 2007. Retrieved 26 July 2008. ^ a b c "Guildhall". Borough of Poole. 2007. Archived from the original on 17 May 2008. Retrieved 15 July 2008. ^ "The Guildhall". English Heritage. 2008. Retrieved 18 July 2008. ^ "Restored Guildhall to open doors". BBC News. 29 April 2007. Retrieved 16 July 2008. ^ "Poole Park". Borough of Poole. 2007. Retrieved 10 June 2008. ^ "£2m Transformation of park begins". BBC News. 26 September 2006. Retrieved 10 June 2008. ^ "Poole Park Lake". Borough of Poole. 2007. Retrieved 16 July 2008. ^ "Rockley at Poole Park". Rockley Watersports. 2007. Retrieved 16 July 2008. ^ "Hundreds run in park". Bournemouth Daily Echo. 2008. Retrieved 10 June 2008. ^ "Poole Tourist Attractions and Poole Sightseeing". World Guides. 2008. Retrieved 18 July 2008. ^ a b "Beach Information – General". Borough of Poole. 2008. Archived from the original on 8 July 2011. Retrieved 16 July 2008. ^ "Poole's Blue Flag Beaches 'Come of Age'". Borough of Poole. 2008. Retrieved 16 July 2008. ^ "Dorset Beaches". Newsquest. 2008. Retrieved 16 July 2008. ^ "RNLI near you". Royal National Lifeboat Institution. 2008. Archived from the original on 6 October 2008. Retrieved 30 July 2008. ^ "Listed buildings online: Church Of St James". English Heritage. 2008. Retrieved 24 August 2008. ^ "Listed buildings online: Church Of St Aldhelm". English Heritage. 2008. Retrieved 24 August 2008. ^ Historic England. "Church of St Mary, Longfleet (1217494)". National Heritage List for England. Retrieved 11 September 2012. ^ "History". Find your local Christadelphians - Dorset. ukchristadelphians.org.uk. 2017. Retrieved 29 January 2018. ^ a b "Recreation and leisure" (PDF). Royal Haskoning. 2008. Retrieved 29 June 2008. ^ "Beach Information". Borough of Poole. 2008. Retrieved 29 June 2008. ^ "Sandbanks to get new summer beach festival". BBC News. 2 May 2010. Retrieved 30 September 2010. ^ "Beach Polo Comes to Sandbanks". Borough of Poole. 2008. Retrieved 29 June 2008. ^ "Dorset Dolphins". MEE. 2013. Retrieved 20 March 2016. ^ "OK World Championship, 2004". International OK Dinghy. 2008. Archived from the original on 5 January 2009. Retrieved 29 June 2008. ^ "Upcoming J24 Events". Poole J/24. 2008. Archived from the original on 26 April 2008. Retrieved 29 June 2008. ^ "61st Poole Week". Parkstone Yacht Club. 2008. Retrieved 29 June 2008. ^ "About the club". Parkstone Yacht Club. 2008. Archived from the original on 19 June 2008. Retrieved 29 June 2008. ^ "Poole Town". Southern Football League. 2011. Archived from the original on 15 April 2012. Retrieved 29 November 2011. ^ "Honours". Poole Town F.C. 2008. Archived from the original on 21 August 2008. Retrieved 10 June 2008. ^ Ashdown, John (28 May 2008). "The Knowledge". London: The Guardian. Retrieved 29 June 2008. ^ Bamford, Robert; Shailes, Glynn (2004). 50 Greats: Poole Pirates. Tempus Publishing. p. 58. ISBN 0-7524-3257-5. ^ "Poole Greyhounds". Stadia UK. 2008. Archived from the original on 2 July 2008. Retrieved 29 June 2008. ^ Poole Harbour Trails at www.pooleharbourtrails.org.uk. Retrieved 6 January 2017. ^ Cycling at www.pooletourism.com. Retrieved 6 January 2017. ^ "Beating the Poole Sea Bounds". Poole Rotary Club. 2008. Archived from the original on 8 July 2008. Retrieved 4 August 2008. ^ "The history of Winchelsea". Winchelsea Community Office. 2008. Archived from the original on 28 February 2007. Retrieved 30 August 2008. ^ "Beating of the Bounds of Poole Harbour". Borough of Poole. 2000. Retrieved 4 August 2008. ^ "Summertime in the South Events". Poole Tourism. 2008. Archived from the original on 15 July 2011. Retrieved 4 August 2008. ^ "The Lighthouse, About us". Arts Council of England. 2007. Archived from the original on 5 January 2010. Retrieved 10 December 2007. ^ "Conference Location". Arts Marketing Association. 2003. Archived from the original on 3 July 2013. Retrieved 30 June 2008. ^ "History: 1980s – USSR to USA". Bournemouth Symphony Orchestra. 2008. Archived from the original on 22 September 2011. Retrieved 28 September 2008. ^ "Poole Museum". Poole Borough Council. 2007. Archived from the original on 8 August 2007. Retrieved 19 July 2007. ^ "Twin bridge is given the go-ahead". BBC News. 11 August 2006. Retrieved 10 December 2007. ^ "£37m Poole Twin Sails Bridge 'glitches' defended". BBC News. 19 December 2012. Retrieved 4 April 2017. ^ "Working on the chain gang". BBC. 2008. Retrieved 25 September 2008. ^ a b "Wilts & Dorset". Go-Ahead Group. 2008. Archived from the original on 6 November 2006. Retrieved 18 June 2008. ^ a b "Buses in Poole". Borough of Poole. 2012. Retrieved 29 May 2012. ^ "Travel Search". Carl Berry. 2012. Retrieved 29 May 2012. ^ "Weymouth to London Waterloo timetable" (PDF). South West Trains. 2012. Archived from the original (PDF) on 13 August 2012. Retrieved 29 May 2012. ^ "Poole to France ferries". Brittany Ferries. 2013. Retrieved 11 December 2013. ^ "Poole Ferry Terminal Guide". Condor Ferries. 2007. Archived from the original on 17 May 2008. Retrieved 18 June 2008. ^ "Flight operators". Bournemouth Airport. 2017. Archived from the original on 1 April 2017. Retrieved 4 April 2017. ^ "Schools in Poole". Borough of Poole. Retrieved 7 April 2017. ^ a b "Local information for Poole". Dorset Echo. 2007. Archived from the original on 13 June 2008. Retrieved 23 June 2008. ^ "Ofsted Inspection" (PDF). Ofsted. 2007. Archived from the original (PDF) on 31 October 2008. Retrieved 23 June 2008. ^ "How different areas performed". BBC News. 10 January 2008. Retrieved 23 June 2008. ^ a b "Secondary School achievement and attainment tables 2007". Department for Children, Schools and Families. 2007. Archived from the original on 24 October 2009. Retrieved 23 June 2008. ^ "School and college (post-16) achievement and attainment tables 2007". Department for Children, Schools and Families. 2007. Archived from the original on 14 October 2009. Retrieved 23 June 2008. ^ "Bournemouth University". Borough of Poole. 2008. Archived from the original on 1 December 2008. Retrieved 23 June 2008. ^ "Welcome to Bournemouth University". Bournemouth University. 2008. Archived from the original on 30 March 2008. Retrieved 23 June 2008. ^ Bremner, Charles; Robertson, David (2008). "Profile: Bournemouth University". London: The Times. Retrieved 23 June 2008. ^ "Arts Institute at Bournemouth". British Council. 2008. Retrieved 29 August 2008. ^ "Visit Us". Dorset Police. 2017. Retrieved 7 April 2017. ^ "Keys to new Joint Emergency Services Building handed over". Dorset Police. 2009. Retrieved 14 April 2010. ^ "Poole Hospital". Care Quality Commission. 2016. Retrieved 7 April 2017. ^ "Poole Hospital Centenary" (PDF). National Health Service. 2008. Archived from the original (PDF) on 31 October 2008. Retrieved 10 August 2008. ^ "What we do". Poole Hospital NHS Foundation Trust. 2017. Retrieved 7 April 2017. ^ "South Western Ambulance Service". National Health Service. 2008. Archived from the original on 12 June 2008. Retrieved 10 August 2008. ^ "Poole extends Viridor waste and recycling contract". Letsrecycle.com. 30 July 2014. Retrieved 7 April 2017. ^ "Code of practice" (PDF). Wessex Water. 2010. Retrieved 7 April 2017. ^ "Daily Echo". Bournemouth Borough Council. 2008. Archived from the original on 17 June 2013. Retrieved 10 August 2008. ^ "Bournemouth – Daily Echo" (PDF). ABC. 2017. Retrieved 7 April 2017. ^ a b c "Poole Knowledge: Facts and Trivia". Poole Tourism. 2008. Archived from the original on 6 January 2011. Retrieved 30 June 2008. ^ "Tolkien's home to be demolished". BBC News. 7 September 2007. Retrieved 30 June 2008. ^ Redwood, Fred (23 March 2003). "Manager's selection". The Times. London. Retrieved 30 September 2010. ^ "National Commission for Decentralised cooperation". Délégation pour l’Action Extérieure des Collectivités Territoriales (Ministère des Affaires étrangères) (in French). Archived from the original on 27 November 2013. Retrieved 26 December 2013. ^ "Twinning". Borough of Poole. 2008. Retrieved 5 December 2012. Beamish, Derek; Hillier, John; Johnstone, H.F.V. (1949). Mansions and Merchants of Poole and Dorset. Poole Historical Trust. ISBN 0-7137-0836-0. Cullingford, Cecil N. (1988). A History of Poole. Phillimore & Co Ltd. ISBN 0-85033-666-X. Legg, Rodney (2005). The Book of Poole Harbour and Town. Halsgrove. ISBN 1-84114-411-8. Sydenham, John (1986) . The History of the Town and County of Poole (2nd ed.). Poole: Poole Historical Trust. ISBN 0-9504914-4-6. Wikimedia Commons has media related to Poole.